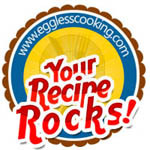 Cracked Wheat Dosas – Your Recipe Rocks! When I saw Broken Wheat Idlis in Anjali’s blog, I had to try it immediately because we all like cracked wheat very much. These dosas are very easy to prepare. Just soak 1/2 cup of urad daal and grind it. At the end add 2 cups of cracked wheat also and grind it to combine well with the urad daal batter. 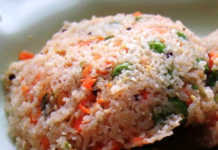 The first time I made it, I also soaked the cracked wheat, just like soaking idli rava while preparing regular idlis. But it became so sticky and stringy and I had a tough time mixing it with the urad daal batter. But finally, it all came together. At first, I greased just one idli plate and poured the batter in the 4 molds and steamed it a little longer than the rice idlis. Even though it was flat, the taste was very good. I think I should have prepared a nice thick batter. So I ended up preparing the Broken Wheat Dosas she has mentioned, using the same batter and my vote is definitely for the dosas. 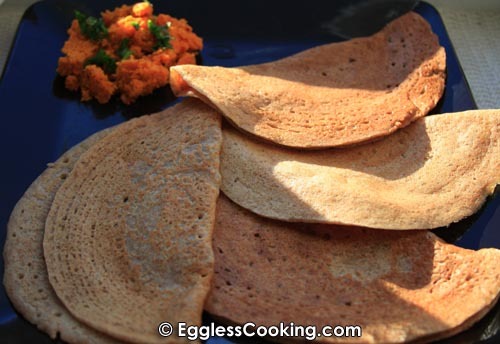 I used the reddish/brownish color cracked wheat and the dosas had an amazing golden color. 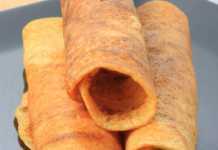 The specialty of this batter is, you can make nice crispy dosas as well as soft sponge-like dosas. The cracked wheat we get here is not fine like regular rava (sooji), so I had to run it in the blender for a couple of minutes, to get a fine texture. The second time I prepared the batter without soaking the cracked wheat, incorporated it to the urad daal batter directly and ran the wet grinder for a couple of minutes. This time also we loved the dosas. This is way healthy than our regular rice dosas and good for diabetics also. Anjali, Your Recipe Rocks, and this recipe is definitely a keeper. Previous RecipeI Can’t Believe It’s Eggless Chocolate Cake! Good for diabetic patients.Surely I’ll try this. lovely dosas and lovely pic madhu..nice way to replace rice..
Hey …very interesting. Must try. The broken wheat idlis I have heard of, do not use urad dal. Just soak the borken wheat with curd for sometime, and steam in idli pan. I fpound that these idlis shd be eaten immediately, else they become hard as rocks! Curious how the dosas shape up. This one looks good! Dibs, welcome to my blog. 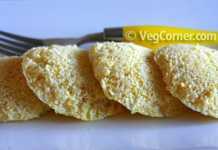 I have also made the instant cracked wheat idlis you have mentioned and it’s in my blog too. You would definitely like these dosas. Hey Madhuram the dosas look so sunny! Yes soaking the cracked wheat makes it reaaally sticky. Thanks for your stamp of approval! YRR is kewl !!! dosas look yummy. I make adai out of cracked wheat. Let me try making dosas with your method. Surely I am going to try this fermentation method Madhu..Dosas are looking so soft!! hmm nce idea for breakfast…looksyum,.